Fencers with little or no fencing experience will have the opportunity to work with patient, experienced instructors to learn the fundamentals of foil fencing. Each day will include games to improve athletic conditioning and strategic thinking, as well as group instruction and drilling to learn fencing skills and concepts. Wear comfortable clothing and athletic shoes; bring a water bottle and snack. 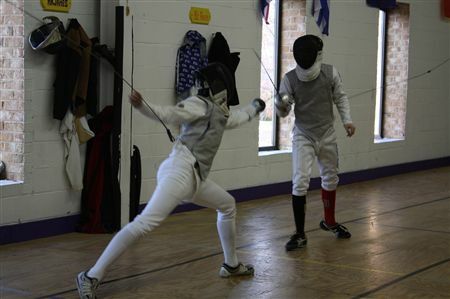 All fencing equipment is provided. This camp is for serious beginning to advanced competitive students. Fencers will start with stretching and warm-up games each day before developing their fencing skills with footwork, blade work, controlled bouting, rules review, and conditioning activities. Full week, daily rate, and half-day sessions are available. Students should dress in comfortable athletic clothing and bring lunch, snacks, and a water bottle.